Specialized courses Professional Massage Level III (the highest qualification, eastward). This course is designed for professional training in special techniques, allows the masseur to do the job the most efficient, with a significant decrease in physical activity. The course was designed specifically with the many requests for massage professionals, under a common theme – reducing unsustainable burden. The basis of this course, put the motto – “Take care of yourself”. Introduction to the curriculum level III. A Brief History of SPA massage. The combination of SPA massage with aromatherapy. The combination of Spa relax massage with aromatherapy. Recommendations to the Sultan massage. A Brief History of Turkish classical massage. The main contraindications to the procedures of Turkish classical massage. Indications for the procedures of Turkish classical massage. The physiological action of the Turkish classical massage procedures on the human body. Creating a favorable environment for the conduct of Turkish classical massage procedures. Basic rules and requirements for the conduct of Turkish classical massage procedures. The combination of Turkish classical massage with aromatherapy. Position of the patient during the procedures of Turkish classical massage. Psychology of Turkish classical massage procedures. The completion of the procedure of Turkish classical massage. Recommendations to the Turkish classical massage. Creating a conducive atmosphere for spa treatments. 36 Academic. hours. The certificate will not be issued until, while the student learns the information is not. Extra cost for additional time is needed! Provides specialized textbook, video video studio TSPRM. Practical classes begin the first day of training. The schedule specifies the secretary. Basic – 17 500 Rub. Individual training – 32 500 Rub. VIP-client (individual classes) – 50 400 Rub. 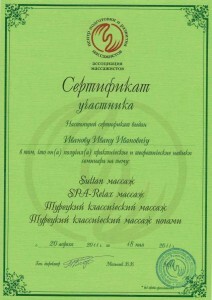 The program is recommended "Association of Massage Therapists"
Graduates of this course have a unique opportunity to take part in the International World Championships in Spa-Massage. The possibility of practical training abroad. The company provides TSPRM at the seminar professional massage tables, to consolidate the knowledge acquired in the home! The company provides free TSPRM all consumables and equipment,for practice at the center. Specialized courses massage eastward present you with information on the ratio of massage I, II, III levels, talk about the teaching level III. Particular attention is paid to the program in such types of massage, как Sultan массаж, Spa relax массаж и турецкий классический массаж. You can also get useful tips on how, how to create a favorable atmosphere for the Spa-procedures, Improvisation. Novelties of the program are the salt body scrub containing algae, body wrap seaweed and stone therapy (relaxation). In the «Spa relax massage" you will learn a brief history of SPA-massage, with the notion of direction in the SPA-massage techniques, major contraindications and indications for the SPA-massage, objectives and physiological effects of procedures SPA-massage on the human body, SPA-massage combined with aromatherapy and other treatments, requirements for the SPA-massage (the patient, massage therapist, equipment, placement), methods and techniques of massage treatments SPA-on parts of the body and other important aspects of. Разделы «Sultan массаж» и «Турецкий классический массаж» предоставят интересную информацию не только о технике и приемах этих видов массажа, and myths, legends and facts, that are associated with them. New items will be pleased with the program you useful recommendations, information on indications and contraindications, areas of procedures, techniques and methodology for the salt body peeling with the content of the algae, about the body wrap seaweed and stone therapy (relaxation).